Solar thermal technologies capture the heat energy from the sun and use it for heating and/or the production of electricity. This is different from photovoltaic solar panels, which directly convert the sun’s radiation to electricity. There are two main types of solar thermal systems for energy production – active and passive. Active systems require moving parts like fans or pumps to circulate heat-carrying fluids. Passive systems have no mechanical components and rely on design features only to capture heat (e.g. greenhouses). The technologies are also grouped by temperature - low, medium or high. Low-temperature (<100°C) applications typically use solar thermal energy for hot water or space heating (Boyle, 2004). Active systems often consist of a roof-mounted flat plate collector through which liquid circulates. The collector absorbs heat from the sun and the liquid carries it to the desired destination, for example a swimming pool or home heating system. Passive heating systems involve intelligent building design practices, which cut back on the need for heating or cooling systems by better capturing or reflecting solar energy. Medium-temperature (100-250°C) applications are not common. An example would be a solar oven, which uses a specially-shaped reflector to focus the sun’s rays on a central cooking pot Lorenzini, G., Biserni, C., & Fiacco, G. (2010). Solar Thermal and Biomass Energy. Ashurst, GBR: WIT Press. Retrieved from http://site.ebrary.com.ezproxy.lib.ucalgary.ca/lib/ucalgary/docDetail.action Lorenzini, G., Biserni, C., & Fiacco, G. (2010). Solar Thermal and Biomass Energy. Ashurst, GBR: WIT Press. Retrieved from http://site.ebrary.com.ezproxy.lib.ucalgary.ca/lib/ucalgary/docDetail.action . Similar systems could be used for industrial processes, but are not widely used. 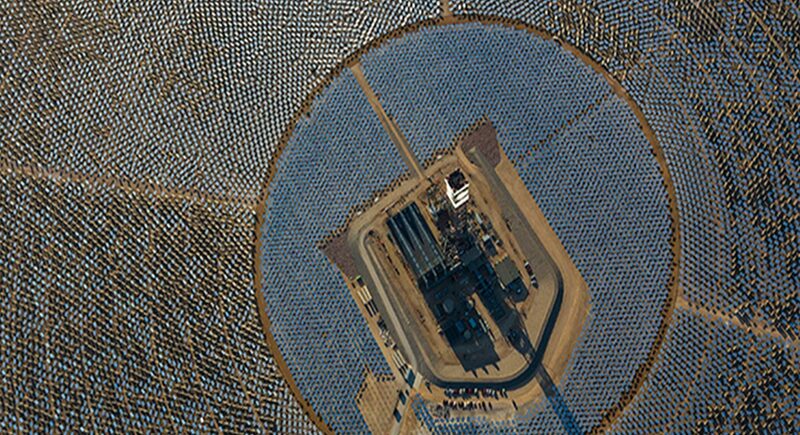 High-temperature (250°C >) solar thermal systems use groups of mirrors to concentrate solar energy onto a central collector. These concentrated solar power (CSP) systems can reach temperatures high enough to produce steam, which then turns a turbine, driving a generator to produce electricity. Solar thermal systems have several advantages. The ‘fuel’ that powers them is free and renewable, so these systems are cheap to run and can replace some conventional fuel use. Solar thermal is an emission-free source of energy. Finally, solar thermal systems are relatively low maintenance because they use simpler technologies and passive systems that have no moving parts. In the case of CSP, the technology’s ability to produce large-scale generation is an advantage for regions that utilize a centralized electricity distribution system. Although abundant, many aspects of sunlight can cause problems for the use of solar thermal systems. Sunshine is not a very concentrated energy source, so it can take a large area to make a reasonable amount of energy, evoking land-use concerns Boyle, G. (Ed.). (2004). Renewable Energy (Second.). Oxford: Oxford University Press. Boyle, G. (Ed.). (2004). Renewable Energy (Second.). Oxford: Oxford University Press. . Sunshine is also intermittent and its availability is dependent on location EIA. (2013). Solar - Energy Explained, Your Guide To Understanding Energy - Energy Information Administration. Retrieved May 31, 2014, from http://www.eia.gov/energyexplained/index.cfm?page=solar_home EIA. (2013). Solar - Energy Explained, Your Guide To Understanding Energy - Energy Information Administration. Retrieved May 31, 2014, from http://www.eia.gov/energyexplained/index.cfm?page=solar_home . The location of CSP installations causes additional problems for the technology. Many are normally located in remote, desert areas, and, given that steam turbines produce electricity for CSP, water access and rapid evaporation are key concerns for the viability of the technology. In addition, transmission of electricity over large distances is expensive and can lead to distribution losses. Finally, practical challenges such as upfront capital costs and awareness of solar thermal technologies can also be barriers to implementation in some countries. a, b, c Boyle, G. (Ed.). (2004). Renewable Energy (Second.). Oxford: Oxford University Press.